It won't give you as many retro-gaming options as the GP2X, but if you're satisfied with a little classic NES action as a break from your daily grind, Odna's upcoming VX737 PMP looks like it should suit you just fine. 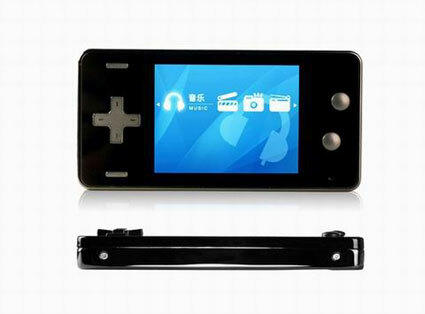 Of course in addition to emulating that massive library of 8-bit goodness, the PMP will also handle MP3, OGG, FLAC, and WAV audio, as well as AVI, MPEG-4 SP, XviD, and DivX video, which you can view on the player's 2.5-inch QVGA screen. What's more, it appears that Odna's "inspiration" knows no bounds, with the VX737 sporting a curiously familiar menu system so you'll feel right at home (check after the break). On the storage tip, you'll get 512MB built-in, though there's no mention of an SD slot or other means of expansion; there's also no word on pricing or availability, but as with oh so many of these foreign products, it seems safe to assume that we won't be seeing this reaching our shores anytime soon, lest they get their asses sued by a tag team of Sony and Nintendo.